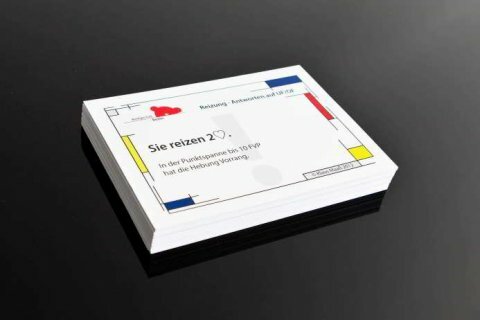 Brand new unique flashcards. Try it – you’ ll improve your bridge!. Finally they’re available: flashcards for bridge! In over ten years of teaching well over a thousand students, we have accumulated expertise and knowledge when it comes to the needs of bridge learners. The globally proven learning principle of flashcards, which you might know from language learning, is now finally available for bridge. It is not about memorising – as in vocabulary learning – but about understanding. Through frequently looking at the cards and at the practical example in your hand, you will become increasingly confident when it comes to bidding. En passant, you will be able to repeatedly read explanations on why you should only place a certain bid. The principle of flashcards uses a filing box/stack and five different themes (more information can be found here). You can also just take the cards and work through them one by one. Incorrectly answered questions are replaced in the middle of the stack, so that those cards come up again sooner. Correctly answered cards are returned to the bottom of the stack, so that they reappear only when the stack is fully completed. Whether you use it as a distraction or want to focus on it completely, whether you’re at home, on the move or on your lunch break – it makes no difference. The more frequently you practice, the more confident you will become in bidding and in playing – as you learn from the topic of your card set. Our plan is to publish at least five sets of cards per week. For every level – for every system. 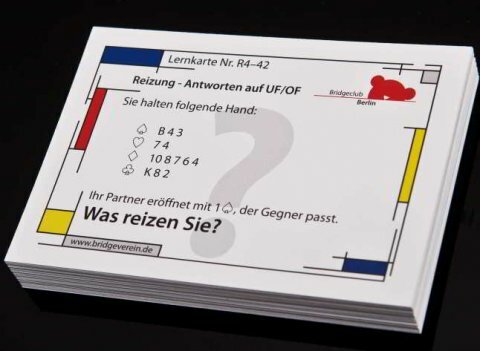 There are flashcards for particular hands, specific bidding sequences, simple definitions or situation questions, and questions on playing techniques and conventions. Believe me, you will find the card deck that’s right for you – and will become ever more confident. You can work on one specific topic and, when you’re finished with it, you can move onto the next topic or shuffle the flashcards. Just as you like. You receive an overview of each set of cards with the learning content. If you are specifically looking for a particular set of cards, please contact us. We are open for requests, and can prioritise the sets as necessary.